The Best Damn Analysis of Texas — Are the Ducks on the ‘Horns of a Dilemma? That title is a lofty claim, but most of you have read my work for a couple of years and know that when I make an infrequent boast like that — I always back it up. I assert this because, like you, I have read the stat-filled reports that give us names, but very little in the way of details about the Longhorn team. What is the best way to learn about this bowl opponent? You have to watch every game and read a ton of football analysis and commentary about them, OR you consult with a Texas fan that is also knowledgeable about football. Coach Lee Staley of Houston was superb to interview because he gave us a very objective view of the Longhorns, even while his passion flowed for his favorite team, as we love our Ducks. You will learn some things not seen on other sites (to date), as I did, and I welcome feedback from Texas fans who can offer more in the relative strengths and weaknesses of the ‘Horns. 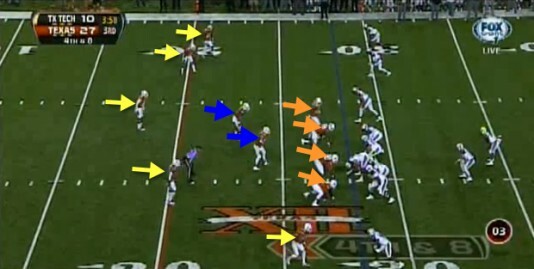 A strength of the Longhorns is the left side of their offensive line, behind which they will run behind, often with Inside and Outside Zones, along with a couple variations of the Power play. Above is an Inside Zone play where they add the Fly Sweep misdirection, as well. They WILL hand off on the Fly Sweep on occasion, and note that I stated Inside Zone, and not Inside Zone Read. They do not read a defender and simply run the basic play but do it very effectively. This team loves to pound the ball with their big backs that cannot be stopped short of five yards if they have not been hit yet at the line of scrimmage. Coach Lee explained that Texas can run the ball with a little play-action passing to get and hold a lead. The problem for other teams has been stopping this power running attack with the two very talented blockers on the left side leading the way. Throw in a H-back and some misdirection — along with Oregon’s weakness against the run in the final four games of the season, and I come away very concerned as I view the Texas ground game. Lee explained to me that, “when the ball is inside the five yard line — Texas is nearly impossible to stop. We sometimes will line up two tight ends (as above) or a bunched formation where we bring in a guard (#66) as a tight end and run it over the left side. It’s a touchdown every time.” As he described some of this, my mental pictures went back to Stanford and made me wonder if the Texas coaching staff would run these formations other than in the Red Zone? Scary. The coach also warned about being too focused on stopping the running game of the Longhorns, as an incredibly crafty WR, Mike Davis, (above) can get behind any secondary. “He’ll get you for one TD . . . I’m predicting that,” and I’m not sure I would disagree with the Coach. It would appear that an accurate throw isn’t necessary for this talented receiver or for another WR, Marcus Johnson, to score on a wheel route. Lee told me what was good about this Longhorn team, and what he lacked confidence in. ‘We might have the worst Division 1 QB in the nation.” Yikes, yet his stats confirm Lee’s annoyance, as Case McCoy has thrown for 11 TDs, with 11 interceptions, and at Oregon, we know that does not work for a great passing attack. “You will not see him throw passes of more than ten yards outside, deep, (unless Davis is behind the secondary) or even posts or corners. Screens and passes to the short/middle routes, such as the stop or dig, are primarily what he’ll be asked to complete. “He just doesn’t have the arm for the tough throws,” states Lee. My own observation concludes the same as he CAN complete some of those throws, but not consistently — which can put their team in trouble. Texas has a misleading record due to injuries, (such as at QB) and due to the decline and then ascendance of the Longhorn defense. They were gashed for over 500 yards on the ground by BYU. Run over by Ole’ Miss. Texas quickly stopped the bleeding by bringing in an experienced Defensive Coordinator in Greg Robinson, who turned this defense around nearly overnight in the early part of the season. You see above how Texas runs a 4-2-5 defense and even a 3-3-5 defense at times to help overcome some secondary weaknesses. They can do this because they have an incredibly talented defensive lineman in Jackson Jeffcoat who is built like a D-lineman, but fast enough to play linebacker and even drop into coverage. It’s a smart alignment to match their personnel. In addition to the offensive line, we find the other major strength of Texas is their defensive line, even with an exceptional player of this group being out for the year. These guys are great run-stoppers and simply extraordinary on the pass rush. 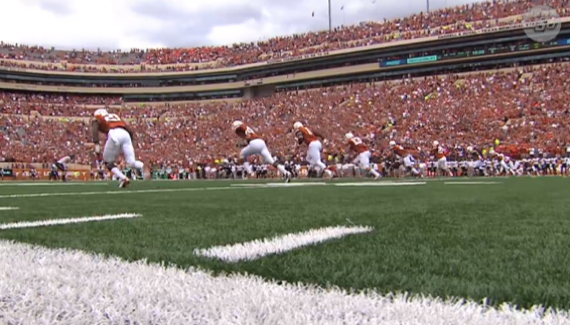 In the play above, we see the best two, Jeffcoat and Cedric Reed meet at the QB against Oklahoma. Reed is amazing in how big, yet how fast and athletic he is. Coach told me it was a strength of the team, and I not only believe it, but worry about our own Inside Zone Read play that our offense is predicated upon. This defensive line is as strong as any we have faced playing the B1G or the SEC (or Stanford) in the past. The linebackers are not exceptional, but effective considering two of those starters were lost for the year to injuries. Lee felt that a real weakness of Texas was the secondary due to also being decimated by injuries. He felt that, “the corners are not great at man coverage, and the safeties do not have great instincts or tackle well in space.” He went on to say that, “you’ll pass the ball on us, if you can keep our defensive line out of the backfield.” It was quite an interesting part of our conversation and listening to him talk of the defensive backs would have made you think that Burnt Orange was the nickname of their secondary. As we talked, he would speak of this former five-star player, and that five-star, and after a bit it became more apparent as to the elite talent level this team attracts. It reminded me of a USC lineup and the biggest surprise was one I did not ponder until later — and that is the respect given to Oregon. It is not that many years ago that Texas fans would have been perhaps a bit dismissive of the Ducks, but this fellow asserted that Oregon would win 48-21 (I suspect a bit of Texas hospitality on his part with that score). Wow! Add all this up and the game plan becomes clear for both teams. Texas has won games by power running with a little play-action passing to keep the lead, and letting their defensive line overwhelm opponents. Oregon does not match up well with Texas in that regard, with our inside running game woes, and our inability to stop an opponent’s running game. The Longhorns are suspect in stopping a good passing attack along with a running QB, thus if Oregon can get a lead — it changes the game dramatically. What interesting story lines to follow as the game progresses, and it will be fun to watch how close “the coach” was in his assessment of both teams. 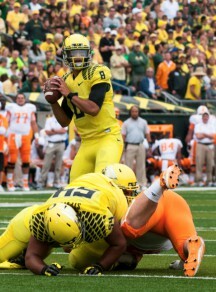 I wish to thank Coach Lee Staley for his time, his respect of Oregon, and his objectivity in looking at both teams. I learned quite a bit that I had not read in other analysis, and, of course, it helps to see examples along with the player’s names who will make this bowl game so entertaining for both sides.